Maintain your property at its best all year long with professional pressure washing by All City Construction and Remodeling. We pressure clean roofs, decks, patios, siding, and more. For over 20 years, All City Construction and Remodeling has provided superior home remodeling services, such as updating kitchens and baths, painting and pressure washing. Call (310) 504-2231 to discover how easy it is to have All City Construction and Remodeling handle the dirty work for you. 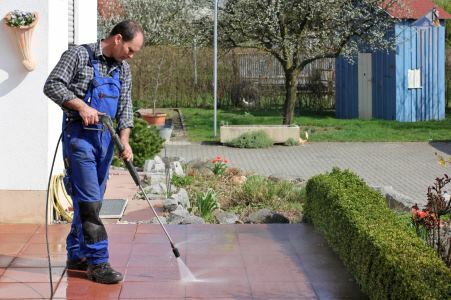 Our local pressure washing crew will leave your property's exterior surfaces spotless and clean. Our cleaning solutions are environmentally safe and won't harm your family or pets. Pressure Washing: Remove Grime and Slime. Outdoor surfaces of your home or office are exposed to the elements 24/7. Which means they get dirty and moldy, grimy and slimy without regular attention. Over time, neglected surfaces can attract mold and mildew and become discolored, detracting from your home's value and appeal. In addition, if mold or mildew grow on walking surfaces, such as patios and decks, they can become slippery and unsafe, especially after a rainstorm. All City Construction and Remodeling offers one-time pressure washing and regularly scheduled maintenance pressure washing to area homes and businesses. Call (310) 504-2231 to schedule your service. All City Construction and Remodeling has been in the home remodeling business since 1999, offering quality exterior improvements on home and businesses throughout the county. Our professional pressure washing crew provides a wide range of exterior building improvement services, including pressure washing for decks and vinyl siding, pool areas, decks, fences, walkways, and even roofs. Call (310) 504-2231 to schedule your pressure washing service.